There was some anticipation for the film A Walk in the Woods (2015) in the national trails community. 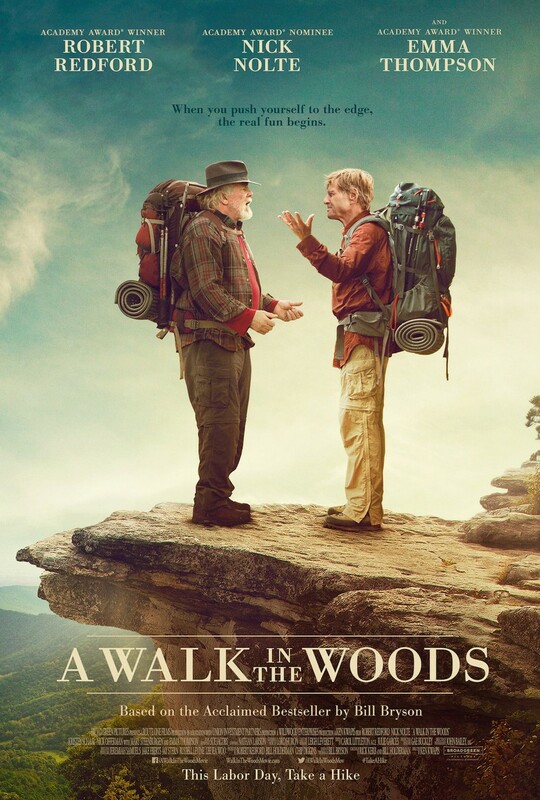 This film version of Bill Bryson’s book of the same name stars Robert Redford and prominently features the Appalachian National Scenic Trail. I allowed some time to pass (probably too much) after seeing this film because frankly I was dreading writing this review… Warning: This is not a good indication that the movie was highly enjoyable! 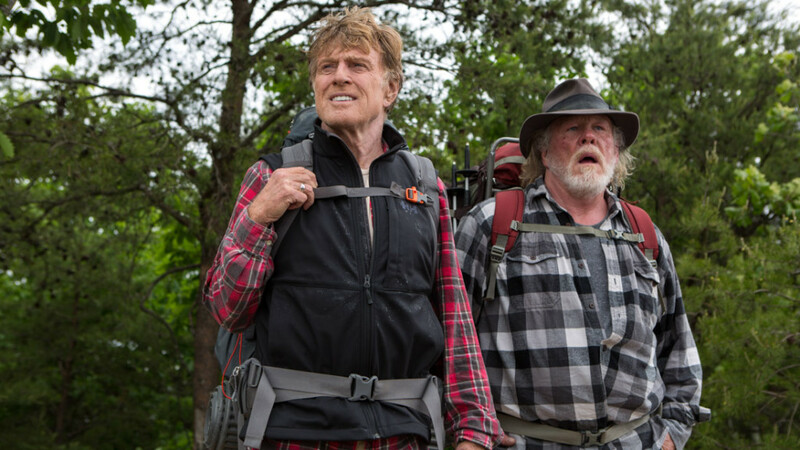 I quickly found myself struggling to listen to the strained, gurgly voice of Redford’s well-meaning but bumbling companion on the hapless hike, played by Nick Nolte. For those that would enjoy the chemistry of these two on screen together for 90 minutes, it may be more enjoyable than what for me simply became laborious — watching two ill-equipped gents stumble along. It was evident they were aiming for humor but maybe the story needed a third stooge for the journey? The film’s official synopsis says the two characters “find out that when you push yourself to the edge, the real fun begins!” I can tell you that if there had been fun of any sort in this film, I probably would not be writing a rough review! Robert Redford’s mostly hallowed career seems lost in this film. Perhaps he was limited by the character he was playing. Having seen him in plenty of masterful performances, you can’t help but feel he had to severely dial himself back here, maybe even dumb himself down. That was a surprise. When the characters finally set out on the trail after all the hand-wringing, there are hints at the restorative powers of nature and the unique freedom to be found on the trail. But these moments quickly become infested by odors of a banal TV sitcom — not the kind of experience most people have on a genuine thru-hike. A bright point in this film is the soundtrack — it’s an excellent mix of current and traditional music that evokes the history and place of the Appalachian Mountains (it’s the least the producers could do)! Also to the film’s credit, A Walk in the Woods did a better job than Wild (2014) in featuring the unique settings and grand vistas that are endemic to routes like the Appalachian and Pacific Crest Trail — cinematic slam dunks. However each film withers when it could be presenting the profound impacts of a thru-hike on a scenic trail — instead they leave us in predictable Hollywood. Maybe the main reason this review is sour grapes stems from the night I saw the film. We spontaneously ended up in the City for a late screening — 10pm on a Tuesday to be exact — and the huge theater was completely empty but for my date and me. By the time the previews ran, we had endured the film and the credits finished rolling, it was well past midnight. This made for plenty of time to think about the movie as we walked through the quiet, foggy streets of San Francisco. I kept thinking that there was one consolation: those two characters from the movie were not walking alongside us!